Casting band members for an alternative rock/punk/pop band! This band will only play and create original songs, practice 2-3 times a week, play live gigs, make music videos, record albums and have a fun time while doing it all. 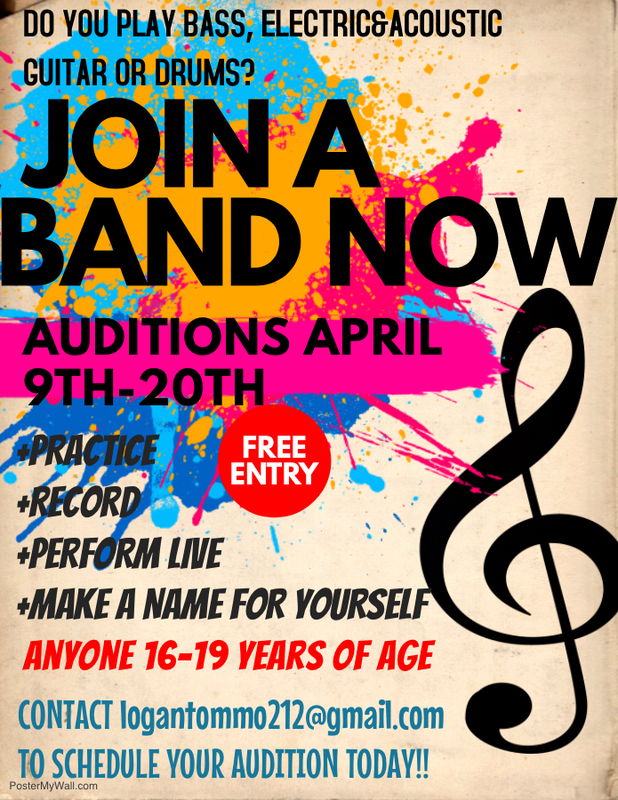 This is a great way to make friends that will last a lifetime and start a music career as a band. Males, Females, NonBinary and Transgender people all welcome to audition as long as they are 16-19 years of age. Email logantommo212@gmail.com to schedule an audition (April 9th-20th). Upon arrival of audition you will be required to fill out an audition form, perform 2 songs (one original, one non original, both with a max time limit of 2 minutes) and then have an (approximately 6 minute) interview. If chosen, you will be notified April 20th and asked to sign a contract outlining all details and commitments of the band (if you are under 18 a parent or legal guardian must sign as well). Band members will be paid by each venue booked and every merchandise (including CD’s) sold. The band will split the profit.